As part of our mission to widely communicate stories of exploration, science, and culture, ConserVentures has launched a new print and digital journal, called terra. Copies of the articles are available free in digital format or to order in print version, via MagCloud, our HP digital partner. At the end of each year we will release the articles plus additional material in a beautiful 65 to 100-page annual collection, printed on semi-glossy recycled paper. Donors, members, and volunteers will receive the annual collection free; the annual will also be available for sale through MagCloud. Be sure to sign up for our ConserVentures news to receive notifications of new article releases. Browse individual articles below; you can download an interactive version now, or go to MagCloud.com to download a free iPad version or order a print version. 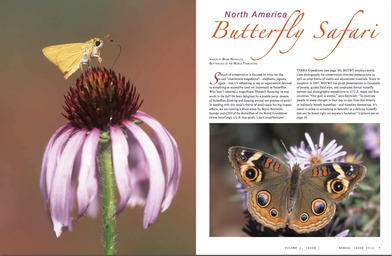 Click image to see more pages from the Annual 2011 edition. Description: Our annual compilation of science, culture, & conservation discoveries around the world. 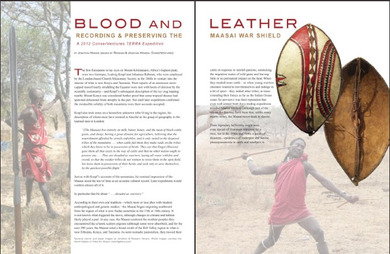 Includes a celebration of "small scale, big results," featuring a biodiversity expedition by river deep into the Sierra Madre of Sonora, Mexico; a North American butterfly safari; and a first look at pages from the forthcoming book on Maasai shield making, part of the Blood & Leather project. Print: $15 (includes donation to ConserVentures). Donors of $50 or more receive the issue free. Click image to see large version. Description: ConserVentures volunteers Steve Hayden and Diane Boyer have spent the past decade working with a Micronesian island community helping to revive traditional boatbuilding. Description: Our annual compilation of science, culture, & conservation discoveries around the world. 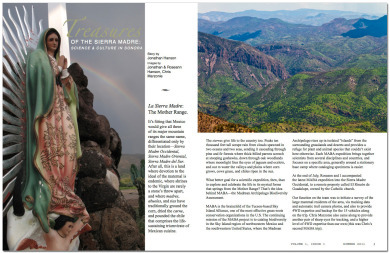 Includes expanded version of the Treasures of the Sierra Madre, Science & Culture in Sonora article; and stories on bacanora; Blood & Leather: Recording and preserving the Maasai War Shield; Tipáálei: Go forward with your spirit (reviving traditional crafts in Micronesia); and Kayaking the Kimberly. Print: $15 (includes donation to ConserVentures). Donors of $50 or more receive the issue free. Description: ConserVentures joins a scientific expedition deep into the heart of the Sierra Madre Occidental, cataloging the astounding biodiversity of this wild region just south of the U.S. border. For iPad and iPhone fans, we also highly recommend the app called Goodreader, a very robust $5 app that will let you open and read the interactive PDFs (via the Download Now button above), so you can access the sound clips and videos as well as open links to view websites—and you can set it to read double-page spreads, so you get the full beauty of the layout. Goodreader does much more, letting you import and organize any files, in a computer-like interface, as well as annotate and share.